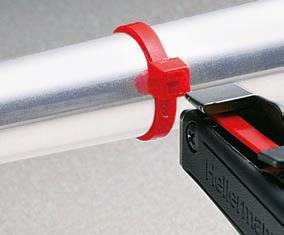 Cable tie gun - The Manual Processing Tool from HellermannTyton. Minimum effort for maximum performance. With a piece of revolutionary TLC-technology (Tension, Lock, Cut) plus an even more ergonomic design that makes full use of modern lightweight materials, we have proven with our EVO7 manual tensioning tool for cable ties that we can indeed significantly reduce operator strain whilst increasing the overall effectiveness of the tool. We carefully considered three key factors that customers told us are the most important for them when choosing a manual cable tie gun: Performance, reliability and comfort. Weight, recoil forces and ergonomics are crucial considerations when it comes to tensioning tools. Repetitive strain injuries (RSI) are the most prevalent and costly cause of injury in the workplace, especially in the wrists, arm and shoulders according to recent occupational health statistics from the United States and the United Kingdom. The first step we took with the EVO7 was therefore to improve its weight by reducing the number of parts. We selected high-quality materials for the internal components and robust lightweight composites for the casing in order to simplify the tool whilst maintaining high reliability and serviceability. The result is 16 per cent lighter than the MK7, which in itself is now heavy-weight. We also looked closely at the ergonomics of the trigger and handle and designed them to comply as much as possible with the shape of the human hand. The EVO7 is consequently offered in two variants (80 mm and 90 mm) adapted for different sized hand spans. The ergonomic fit and comfort of the EVO7 are immediately noticeable to any installer who picks it up for the first time. This has been confirmed in tests conducted by the Center for Ergonomics at the University of Wisconsin (Milwaukee) in the USA − Link to Ergonomic Study: www.hellermanntyton.us EVO7 − good news for the occupational health of installers. 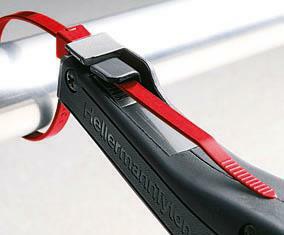 The truly revolutionary feature of HellermannTyton’s EVO7 is what the company calls “TLC”, which stands for Tension, Lock, Cut. This forms the heart of the EVO7 cable tie handgun and makes the big difference over the competition. Traditional cable tie application tools tension and cut whilst continuing to stretch the tie during the cutting process. The TLC technology in the EVO7 takes an entirely new approach by introducing a locking phase, stopping the tensioning process before the blade is sent through the tie. The locking mechanism in the EVO7 brings a host of benefits. The shock to the hand of the operator during the cutting process is eliminated. It also contributes to increased blade life because the tie is not dragged across the blade as it is cut flush. And it also reduces the peak stress that the tie experiences during the cut-off process and prevents overstretching of the tie or damage to the items being bundled. The EVO7 has 33 distinct settings for tension, giving it a broader range of tension adjustments than any other tensioning tool currently on the market. Every EV07 that comes out of the factory is calibrated to cut at precisely the same tension level. This has made it possible to include a ‘zero tension‘ setting required by many operators in the fine electronics industry. Having a reliable factory benchmark means the EVO7 can also be easily recalibrated and set to cut at any pre-determined tension level, from 35 N to 165 N, day in and day out – all good news for customers who must retain a high level of tension quality and repeatability. Reliability also applies to part performance. Besides the weight advantage, reducing the absolute number of parts in the EVO7 was an important aspect of improving cable tie gun serviceability. Continuous testing of the EVO7 has shown that over one million cuts are possible using the same blade. When the time does come to replace a blade, however, this can be done easily by the installer without the need for any special maintenance. Careful design also means that the blade can only be fitted one way – the correct way! – in the nose piece of the tool. 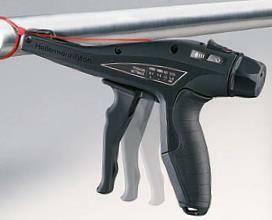 HellermannTyton’s tool engineers are very proud of the technological achievements in the EVO7. The newly designed tool is already proving itself as a worthy successor to the HellermannTyton MK7 cable tie handgun. Spare parts and servicing will continue to be provided for the MK7 workhorse, but all customers are encouraged to pick up an EVO7 and experience first-hand the revolutionary performance and comfort that the Tension, Lock, Cut technology in this manual cable tie tool brings.